Make a gift in honor or memory of an individual. 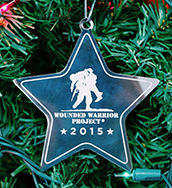 Donate today and receive a free Wounded Warrior Project® (WWP) holiday ornament. This ornament is a symbol of how your support makes a difference in the lives of injured warriors through the WWP programs you help sustain. Your generous, tax deductible donation to WWP enables us to help thousands of injured warriors returning home from the current conflicts and provides assistance to their families. Join the Advance Guard monthly giving program for $19 a month and receive a WWP blanket. Yes, I would like to receive communications from Wounded Warrior Project. Make my gift go further. Do not send me a premium. If the billing and contact information are the same, please check this box. By clicking submit, your credit card will be processed. A donation receipt will be emailed to the email address you provided.